Would You Hire Big Bird? Could Big Bird soon be joining the unemployment line? After the first presidential debate, the name on everyone’s lips didn’t belong to either candidate but to a giant yellow bird who has spent his career teaching children. After Republican presidential candidate Mitt Romney vowed to cut funding for Sesame Street home PBS, while name-dropping Big Bird, America’s favorite giant bird seems to be everywhere. It’s no surprise considering the first presidential debate was one of the most tweeted about events of all time. Big Bird has shown up in Obama ad campaigns and even on Saturday Night Live. Things might be busy for Big Bird now, but soon that might not be the case. If Sesame Street closes down, where will Big Bird go? 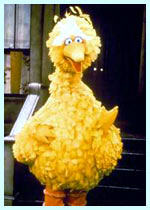 Just like 7.8 percent of the population, Big Bird will be unemployed and starting in on his job search. Of course, just because he’s loveable and hard to miss doesn’t mean your company would hire him. Here are some reasons your company might pass on Big Bird, and why you would want to take a second look. Employers looking for the best people should give every candidate a chance, even ones who are a bit outside the box. You never know, a candidate who seems featherbrained might just end up as your next flagship employee. Big Bird has been a staple of Sesame Street since it’s inception in 1969. This means Big Bird has essentially been doing the same job for the last 43 years. Employers like candidates who don’t hop from job to job and from company to company. However, they also want to see career advancement. If you were looking at Big Bird’s resume, or even at his video resume, you’d wonder why he’s not the mayor of Sesame Street after 43 years on the job. With more job hopping than ever before, it’s nice to see a candidate who knows the value of loyalty. Instead of hiring someone just looking for any job or a rung on a ladder, Big Bird’s career commitment shows he really loves what he does. A candidate like Big Bird who knows what he wants out of his career will be a huge boon to any organization. These are the workers who come into the office with a smile on their face everyday, because they love their job. Not all employees want to be the big shot or the CEO, but this doesn’t mean they can’t bring real value to your company. Big Bird knows he loves his role on Sesame Street, which is why he’s made the street his home for so many years. Companies want great candidates who can work both independently and as part of a team. But Big Bird is the definition of a team player. He rarely goes anywhere without the rest of the Sesame Street gang in tow. Many companies would look at his lack of solo leadership as a negative when hiring. However there’s not much room for the lone wolf in today’s work environment. Even workers who telecommute are in constant contact with coworkers through phone, online video, and instant messaging. Hiring managers performing a video interview can record and share with the whole team and most applicant tracking systems come with collaboration as a built-in component. With all that teamwork happening everyday, having a candidate who works well with others is more of a positive than a negative. Not only does Big Bird know how to get the whole Sesame Street gang to collaborate, he’s also great at networking. Just look at the amount of famous friends who are always stopping by Sesame Street to give Big Bird and pals a hand at teaching important lessons. Just because a candidate isn’t perfect on paper (or video) doesn’t mean they’re not the right person for the job. After all, no one is actually perfect. If you don’t give outside-the-box candidates a shot, you might be missing out on your next superstar like Big Bird. He might be a giant yellow bird, but he would also make a great employee. Would you hire Big Bird? Share in the comments!